What to Expect with Laser Hair Removal…..
Ready to throw out your razors and have touchable smooth, virtually hair-free skin without the pain of traditional laser technology? Ready for answers to your laser hair removal questions? You can have them today. Feel the difference and see the results with our Soprano Ice Laser. The Prestige Medical Rejuvenation Center’s expertly trained medical staff offers comfortable laser hair removal in a variety of packages and options. Contact us today to schedule your appointment. Laser hair removal has the advantage of lasting much longer. If done properly laser hair removal can last for months at a time. If you decide to go this route, here are some of the things you will want to know about laser hair removal and what to expect. Tattoo removal laser prices are based on the size of the tattoo being treated. All patients receive a free consultation prior to treatment in order to provide a Treatment Plan and Cost Estimate. Dr. Jackson utilizes the most powerful laser in the Omaha area in order to minimize the number of treatments required for desired results. Most tattoos require a minimum of 3 treatments, however, all tattoos are different and results may vary. XXLarge – Larger than 8″x8″: Custom pricing is based on the time required for treatment. Laser hair removal attempts to permanently remove unwanted hair. This is done by directing a beam of laser light directly into the hair follicle and destroying the root or bulb of the hair. 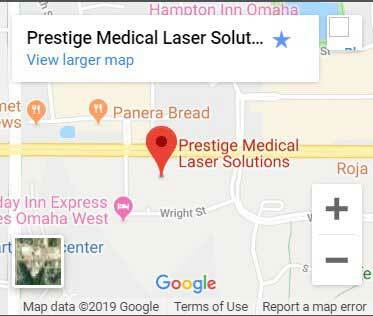 The Food and Drug Administration has stipulated that patients must be advised that even lasers don’t guarantee permanent hair removal. What is available with today’s technology is an effective way to control the appearance of unwanted hair on the face or other areas of the body. The Soprano Ice Laser we use here at Prestige Medical Rejuvenation Center features is very effective and safe to use on all skin tones and hair types. Treatments can be performed any time of the year, including on tanned skin. These revolutionary lasers use long-pulse, high-energy lasers that gently pass through the skin to the targeted hair follicle. The heat from the laser effectively destroys the hair follicle, to deter it from growing back, while leaving the surrounding skin unaffected. Your first visit consists of a consultation where we will examine your skin and also look closely at what type of hair you have on the area from which you want it removed. Treatment sessions are quick, even for large areas such as the legs or back. You can return to your normal activities, including working out at the gym, immediately. The treatment is virtually painless, delivering a massage-like sensation. Good results can normally be achieved within six to eight visits. After that, you can schedule maintenance visits every six months or as needed.